Rabbi Jacob is one of the most loved rabbis of New York. One day, the French side of his family, the Schmolls, invite him to celebrate the bar mitzvah of the young David. Rabbi Jacob boards a plane to leave America for his birthland of France after more than 30 years of American life. His young friend Rabbi Samuel comes with him. In Normandy, the rich businessman Victor Pivert (Louis de Funès) is also on his way; his daughter (Miou-Miou) will be married the next day. Pivert is a dreadful man: bad-tempered, rude and a bigot, with a well-honed racism against blacks, Jews, and pretty much all foreigners. He and his driver, Salomon , have a car accident in which Pivert's car flips upside-down into a lake. When Salomon, who is Jewish, refuses to help because Shabbat has just begun, Pivert fires him, much to Salomon's content. Arab revolutionist leader Mohamed Larbi Slimane is kidnapped by killers who are working for his country's government. The team, led by Colonel Farès, takes him by night to an empty bubble gum factory... the same place where Victor Pivert goes to find assistance. Pivert involuntarily helps Slimane to flee, leaving two killers' corpses behind them. The police, alerted by Salomon, find the bodies and accuse Pivert of the crime. The next day, Slimane forces Pivert to go to Orly airport to catch a plane to Slimane's country . However, they are followed by a number of people: the jealous Germaine, Pivert's wife, who thinks her husband is going to leave her for another woman; Farès and the killers; and the police commissioner Andréani (Claude Piéplu), a zealous and stupid cop who imagines that Pivert is the new Al Capone. Trying to conceal his and Pivert's identities, Slimane attacks two rabbis in the toilets, stealing their clothes and shaving their beards and their payot. The disguises are perfect, and they are mistaken for Rabbi Jacob and Rabbi Samuel by the Schmoll family. The only one who recognizes Pivert behind the disguise is Salomon, his former driver, who just happens to be a Schmoll nephew. But Pivert and Slimane are able to keep their identity secret and even manage to hold a sermon in Hebrew, thanks to the polylingual Slimane . 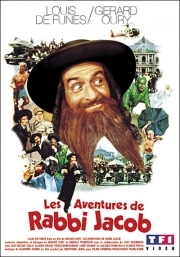 After a few misunderstandings, Commissioner Andréani and his two inspectors are mistaken by the Jews for terrorists, attempting to kill Rabbi Jacob. The real Rabbi Jacob arrives at Orly, where no one is waiting for him any more. He is mistaken for Victor Pivert by the police, then by Farès and his killers . Whole or part of the information contained in this card come from the Wikipedia article "Aventurile rabinului Jacob", licensed under CC-BY-SA full list of contributors here.